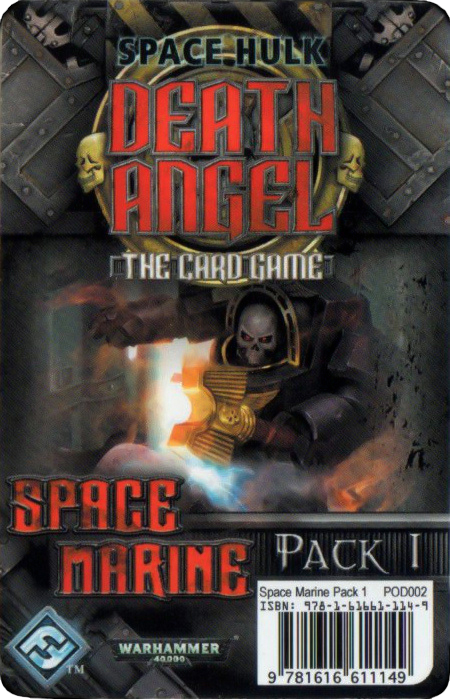 Some time ago I've already reviewed Space Hulk: Death Angel – a card version of famous Games Workshop boardgame. Not so long ago there appeared a reason to return to the topic – I got my hands on two first expansions for this Fantasy Flight Games card game: Mission Pack 1 and Marine Pack 1. So let me share my experience. 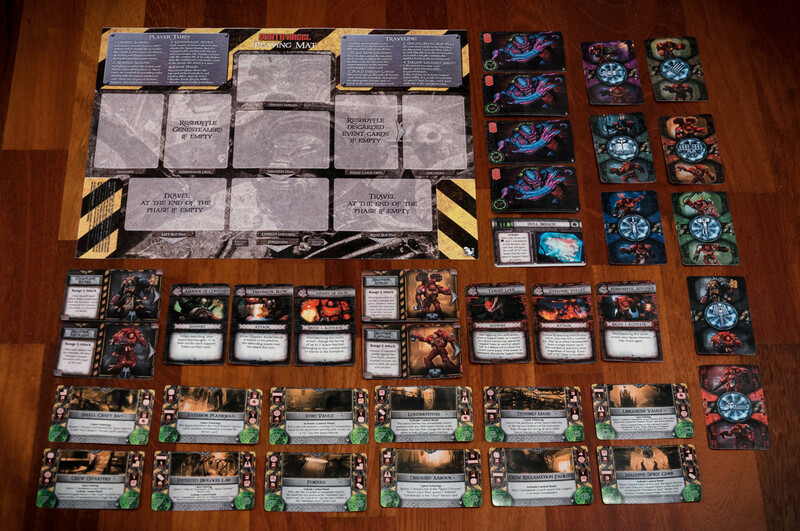 First card set gives players an alternate set of 12 missions to play along with new cards used in them: additional enemies in the face of adrenaline genestealers and a new terrain piece – a hull breach. The rules forbid mixing old missions with the new ones, but for the life of me I couldn't find any reason not to, as it certainly adds more variety. There are quite a number of new cards, but, after a close inspection, new missions turn out to be not so different from the old ones and the new element don’t change the basic mechanic enough to make any serious difference to gameplay. Thus, unfortunately, the expansion plays a very minor role. The variety it provides definitely is not going to hurt, but I don’t think this one is a must for anybody. This expansion is also very minor: all it adds is two new teams of terminators with two warriors in each, along with three order card for each team. However, new marines definitely have some interesting abilities: chaplain Raziel can defend himself even against huge hordes of genestealers and has an ability to turn his allies around to avoid the most unexpected and threatening attacks from behind. For his part, the Cyclone launcher-armed brother Adron is notable for his powerful attack that inevitably kills three genestealers, although at random range. He can also move two times a turn, which, given the game mechanics, allows him to not only move himself and his teammate in needed spot, but also allows the players to move the marines he switches places with. New abilities fit well with ones possessed by terminators from the basic set and make it easier to deal with a lot of scenarios, which ain't bad, given how harsh the core game tends to be most of the time. To sup up, I liked this card set a lot more – the variety it adds is more noticeable, and it works well with the core set as well. Unlike the additional materials above, this playing mat is not an official FFG addition – it is made by fans. 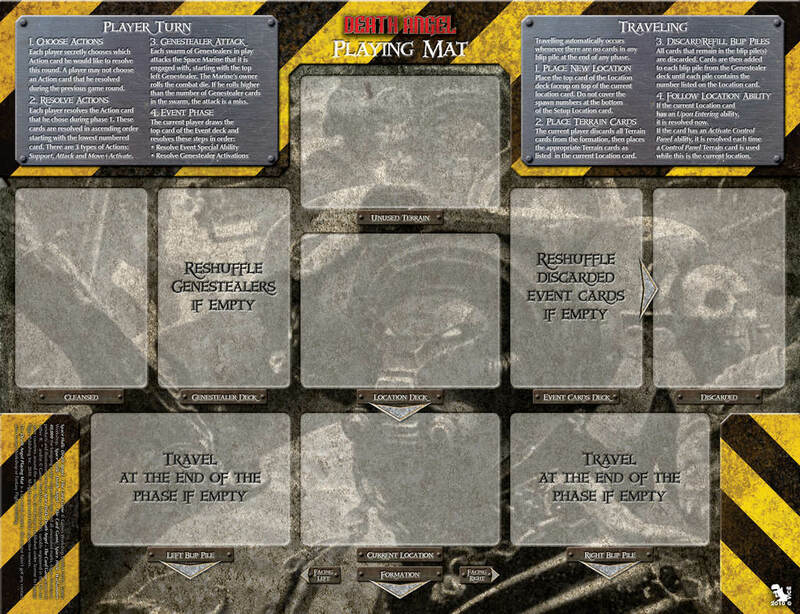 The mat features space to place all cards that go on the top of the playing field, along with some tips in case you forget the turn sequence or some other basic rule. Sounds good in theory, but in practice it isn’t really necessary and for us it ended up to be useful only a couple of times. 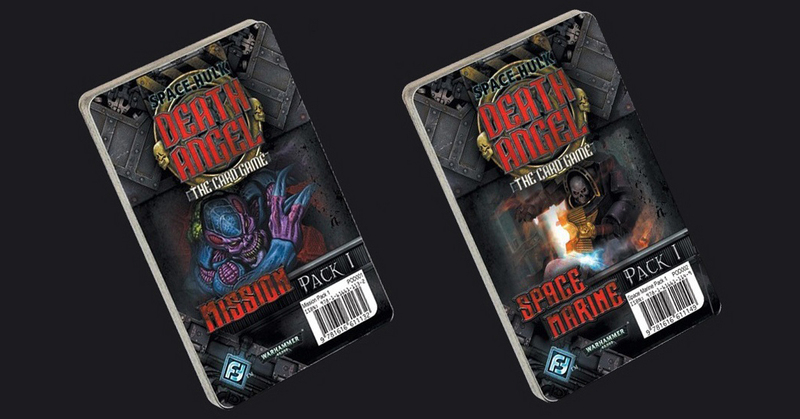 It also takes a lot of space, especially when you consider how small Death Angel box is. In the end, I left the mat I printed out in the club we sometimes play at and we use it only when it’s close at hand. 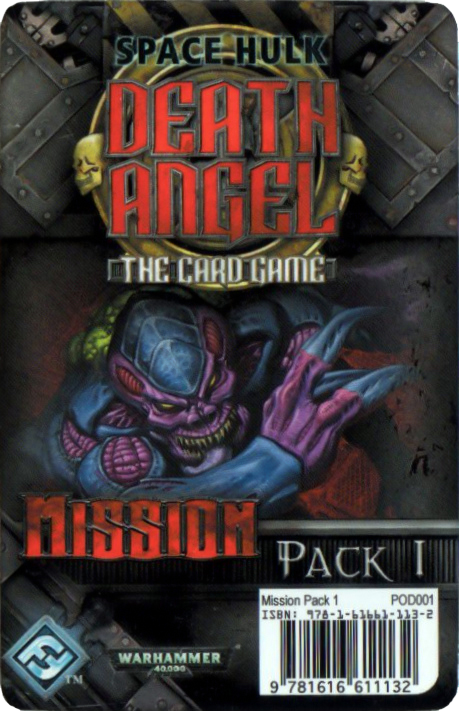 In addition to the ones I described FFG produces two other expansions for Death Angel. However, they work in a little different way to the ones above: the cards in them aren’t just added to the set, but replace some of the original ones. The Deathwing Space Marine Pack replaces Blood Angels terminators with Dark Angel ones, while Tyranid Enemy Pack switches hordes of genestealers to a bunch of other Tyranids. None of these seem particularly interesting to me – BA vs. genestealers conflict is indeed worn out by now, but only the total change of one of the side can make Space Hulk fresh in my opinion. The exchange seems to be of equal value and it only makes sense in two cases: either you are a Dark Angels fan, or you’ve played the game for so long it needs changing to make it fun again. I don’t plan on acquiring any of the above, but you can check them out: if you have some experience with them, it would be interesting to know what you think.